There was a real place called Tar Canyon that was first drilled by the Union Oil Company in 1887, making this area one of Southern California’s first oil fields. 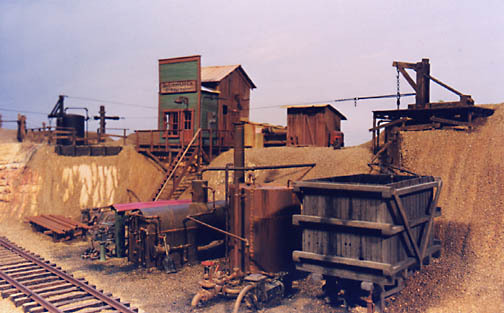 This model refelects what one of these early oilfields looked like and many were still operating into late 1960s when I had photographed them, now the land has all been cleared. I modeled the boiler using brass sheet and both oil tanks, one was constructed of wood and the other brass sheet. There was always plenty of rusty pipe, old valves and other junk about the oil fields. For an oil man, this was really good stuff to keep. 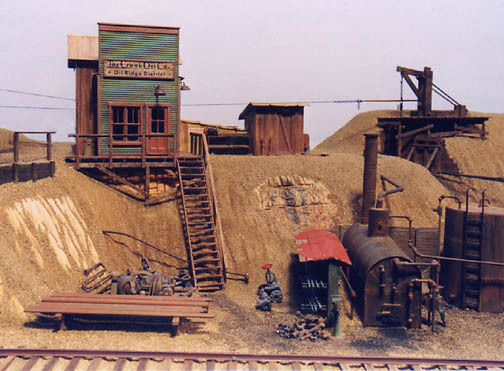 I have my own prototype collection of scrap like this, maybe more than is seen on this model. I modeled three different types of oil pumps used in this type of field called Jack Line Pumps. 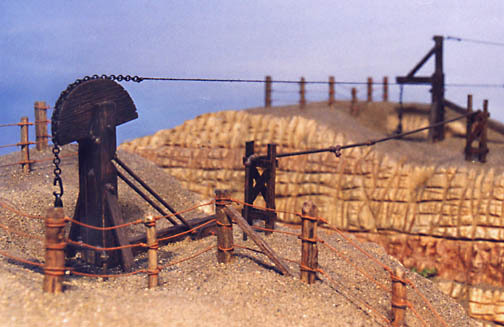 The prototype pumps were made of timber and iron rods, bolts. 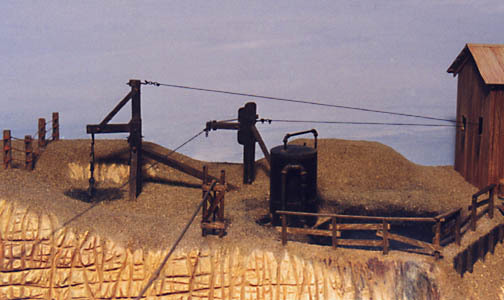 Cable and chain ran from each pump to a building set in the center of the field (like spokes on a bike wheel) that housed the machinery to power to pull the cables. I modeled that standing post unit to change direction of a cable just as the prototype did. The small tank next to the oil sump was used to seperate water from the oil. This model oil field does operate. I used scale wood along with brass rod and tube soldered together. An old clock motor operates the excentric cam that pull the cables made of thread. I built the model over 40 years ago and it still operates just fine, even makes noises just as the prototype did.